6WIND's networking software solves performance and time-to-market challenges for Service Providers, Enterprises and OEMs. The company's flagship vRouter technology is available in software appliance, source code and hypervisor networking form factors optimized for cost-effective hardware, such as Commercial-off-the-Shelf (COTS) servers. vRouter appliances include Turbo Router for IP Routing, Turbo IPsec for IPsec VPNs and Virtual Accelerator for hypervisor networking power. All 6WIND products are built leveraging DPDK for performance. 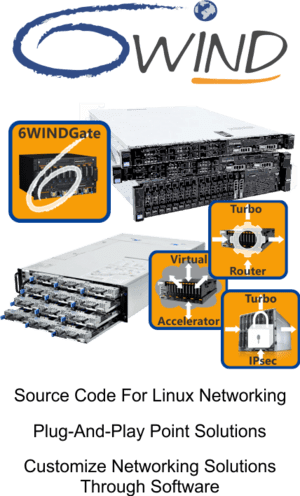 Since 2007, 6WIND's 6WINDGate source code for Linux networking has been selected by Blue Chip companies to unlock hidden infrastructure performance. 6WINDGate is used by developers creating embedded network applications on Linux, such as L2 - L4 acceleration, IPsec VPN gateways, IP routers, TCP termination, virtual switching and other advanced network functions. 6WIND is a founding member of dpdk.org, which is a major open source community that enables high performance network applications such as NFV. 6WIND is based near Paris, France with regional offices in China and the United States. For more information, visit http://www.6wind.com. 6WINDGate packet processing software enables the large scale deployment of high performance infrastructure networks required for fast-growing markets such as 4G/LTE and cloud computing. 6WINDGate is deployed by companies such as Alcatel-Lucent, Cisco, Ericsson, Hitachi, Ericsson-LG, NEC, Nokia, and Trend Micro as a critical element of their solutions for mobile infrastructure and data center networks. Routing and security software appliances for bare metal and virtual machine configurations. Hypervisor scaling with virtual switch acceleration.